How Much Are Selfies Worth? If they’re from Andy Warhol, made with a silkscreen rather than a smartphone, the answer is millions. A series of six of the eccentric American artist’s self-portraits sold at auction Wednesday in New York for $30.1 million. Warhol made the vibrant images of himself wearing his famous “fright wig” in 1986 — a year before his death and just over a quarter-century before the Oxford English Dictionary made the suddenly ubiquitous “selfie” its word of the year. Warhol’s trailblazing, if not technologically parallel, take led the bidding at Sotheby’s contemporary art auction and capped a triumphant week for his work. The artist’s 1960s work “Big Electric Chair,” which shows an execution chamber against panels of blue, green and pink fetched $20.4 million at the same Sotheby’s auction. His “12 Mona Lisas” went for $11.4 million. 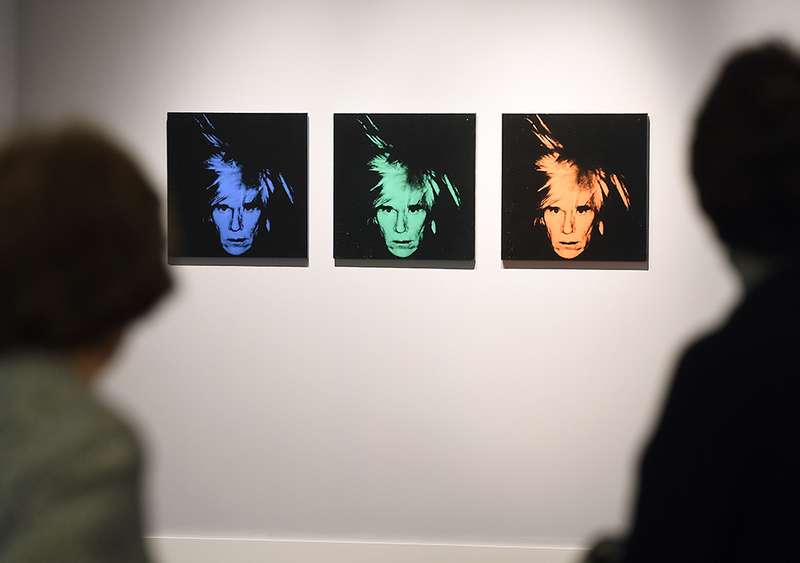 Two other works from Warhol’s “Death and Disaster” series sold Tuesday at Christie’s for a combined $100 million. “Race Riot, 1964” — a four-panel painting of unrest in Alabama — went for $62.9 million at Christie’s auction of postwar and contemporary works. His 1962 painting “White Marilyn,” completed shortly after Hollywood star Marilyn Monroe took her life, sold for $41 million. In all, Sotheby’s sold 67 pieces Wednesday for a total of $364.4 million. All prices included the buyer’s premium. Casino magnate Steve Wynn purchased Jeff Koons’ 7-foot-tall stainless steel sculpture of the spinach-loving cartoon character “Popeye” for $28.2 million and will put it on display at his Wynn Las Vegas property in Nevada, Sotheby’s said. Koons’ “Jim Beam J.B. Turner Train,” a 9½ -foot-long-stainless steel sculpture filled with bourbon, sold Tuesday for $33.8 million. German painter Gerhard Richter’s “Blau” sold Wednesday for $28.7 million, about $9 million shy of his auction record set last year at Sotheby’s. View our Warhol collection including his selfie here.